This is great news! There is a lot that can be learned from the art you guys made! does 3ds max know about xml by default ? or is that a special library you have to tell it to include ? if max does know about xml by default then perhaps this section could be rewritten to help debug it ? Going by the XML files output by OgreXMLConverter in the command line tools, everything in my doggles model should work; it's rigged, etc, completely sound - at that point. Converting it back to a .MESH should be okay, and then the engine loading that .MESH in the mods folder, should work. I read something posted by a dev that was like, the game just can't load new models and DDS files from the mods folders. If that's the case, my mod is good to go when the patch gets released - I'm really anxious to see if it will load correctly then. Of course, I assigned bone weights in a text editor, so for something more complexly animated than a static mesh tacked onto a bodypart, Max importers and exporters will be very helpful. Hope this all gets sorted. I'm sort of thinking that importing from .MESH is not going to work out properly, ever; it's just the export that the engine reads; this is why they're releasing the art source files. I'm so glad other people are trying to help with this, cause I'm useless :roll:. I just assumed that this standalone version was the same as the CommandLineTools version, but I could be wrong :roll:. Anyway, next test, I tried JamesL's solution. I opened the Maxscript in Max and added these lines to it (I remembered to remove the return after the: if FINDSTRING xmlElement xmlAttribute == 0 then return). Then I resaved the script and tested it. Still no luck, I'm still getting the same error message and that same line is still highlighted in the error log . But hey! It was worth a shot. so removing the _ and the / which I think are causing the problems. There will almost certainly be more than one entry in the xml, so in notepad use the find tool and search for "material". and every line that is <submesh material="name/name" or whatever you remove non letters such as / # _ 1-9 etc as above. then resave the xml and try re-importing. Ah bummer! It didn't work . I suggest you try some debugging yourself, each time when max says there is an error I usually uncomment the line and add a PRINT statement with the variable to check if it really is there that the error occurs, sometimes maxscript shows an error line but that is not quit the plays where the actual error is. Makes sence ? Oops what you just said went completely over my head :roll:. I look forward to you finishing this script taylormouse! 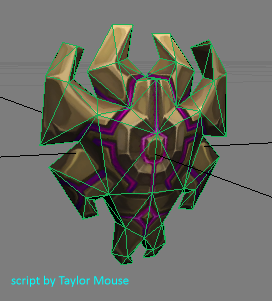 I know the runic dev crew will release proper exporters but I also want to take their models apart that come with the game and adapt them to look entirely new and not just a texture swap. You can make so many more creature out of the mechanical minigun mech in the dwarf levels for example. And decking out monsters with new gear parts or reusing animations from the spider for example for an entirely new spider mesh would also make for some quick but awesome additons to the game. So you have my full attention and support for this script. Same goes for tilesets btw! be nice to modify and extend on the already created tilesets by importing and exporting them again. "Skiffy the junkyard monster shuffles in the dark"
Well most of the time modding tools that are provided, just as the once by Runic Games, ( and those of blizzard for Warcraft 3 ) always have excellent exporters, but what if you would like to study the models already in the game ? I love you guys so much. In a completely platonic way, of course, but in to the fullest extent a man can love a small company. I've just had a thought, can you tell me exactly what you did to import the model (I'm going to try and follow your steps to the letter) ie....put ImportOgreXml.ms in....extracted Pak.zip to.....bla bla bla. 15. you should get the Open File Dialogue and select the xml file. I still can't get it to work. I followed all those steps, but it just doesn't like me . meshName = GetAttribute trimmed "<material"
****!!!! Olympic that did the trick! It works! I opened the script in Max again and added the < symbol in front of "<material" like you said, and now it works . I'm so happy right now, at last I can see how the models are constructed and what their poly count is. TaylorMouse and Olympic you guys are my heroes, thankyou so much for this. Yep it works a treat, but there are a couple of hurdles to jump over before it works. 1. Open Max and click 'Maxscript, then select 'Open Script'. 2. When the script is open, press Ctrl + e. Browse to the .xml file you want to import and click Open. Nothing will happen. But do not close the script window. 3. Click 'Maxscript' again and this time select 'Run Script'. Again, browse to the .xml file you want to import and click Open. The model should now load into Max. The maxscript listener still reports an Error, but the model is imported, so I'm not worrying about it . Nope will do this right now ! a friend of mine asked me to take a look at this script since he was having problems with it. did a few simple and quick fixes and it seems to work fine now, also added the uv in vert space or seperate check so it will import tile set files, it will need a bit of clean up but at least it will import. Hope you enjoy this and most props go to the original auther of this script. You sir RULE. I've been able to import all the models for monsters so far. Cant wait till bones work and vertex colors as well. Thanks to Taylormouse and Cascade. We would not be able to look at the original assets like this otherwise "unless runic releases ALL source.... "
"Skiffy the Junkyard monster jumps with joy and rolls in garbage!" I cannot tell you how awesome you guys are. When I looked at the script, it might as well have been written in Chinese for all the sense it made to me :roll:. You guys are really amazing. Anyway, I can confirm that the new script is working just fine in 3DS Max 8. Cascade I can't thankyou enough for taking the time to help out with this. I tried to help as much as I could, but I really have no idea what I'm doing :roll:. Now we just need to be able to import the bones/animation data and we are in business . Sorry about that Taylormouse, a friend asked and i helped out. he told me to put it up here so i did, if it has offended i apologise for that. as for reviewing the next one, sure. just send it my way and ill take a look, im by no means an expert but 2 are always better then 1.
i was going to add vertex color support so that some of the town houses can be imported as well, just gimme a shout if you have a problem with me changing it any more.